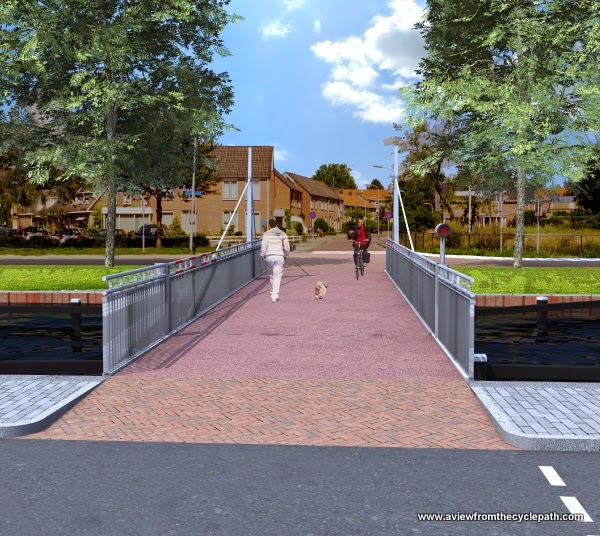 Of six new bridges in Assen, three are only for cyclists and pedestrians. But they're not good enough. I'll only cheer about new infrastructure when it is an improvement. This blog post was written after some of the new infrastructure had been built but before a public meeting which presented some details which were previously unavailable. See the note at the bottom of the blog post. In the past, Het Kanaal ("the canal") was an important trade route for barges which went close to the centre of Assen. It was cut off last century during the period when emphasis was on motor vehicles and much commercial shipping moved from the canals onto roads. 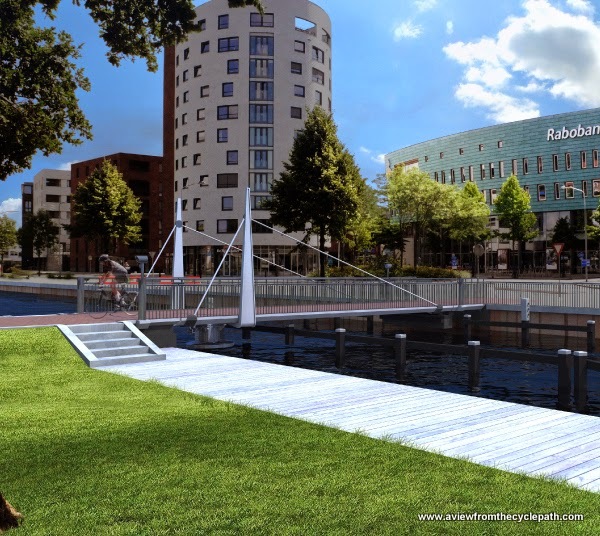 The Blauwe As (Blue Axis) project in Assen seeks to re-open Het Kanaal for recreational use. Six new bridges are being built. Three bridges are for bicycles and pedestrians only, the other three also accommodate cars. Each of the bicycle bridges has replaced a previously existing bicycle bridge while the bicycle and car bridges will replace junctions where the canal had been entirely filled in. It's a very well funded project, a €50M part of the Florijn As project which in total will cost €1.5 billion. When I first heard of this project I hoped that by this date I would be writing about impressive new cycling facilities which resulted from the new investment. Unfortunately, the planning process has been rather opaque so far as the public is concerned. We've seen flashy videos but not a lot of detail. thus far it has been could have written about six new wonderful bridges. It would have been dishonest to write about the new proposals based on nothing but the flashy plans presented and very little information was made available before building. At best, this could have been a chance to improve conditions for cyclists. It could also have been a sideways move for cyclists. 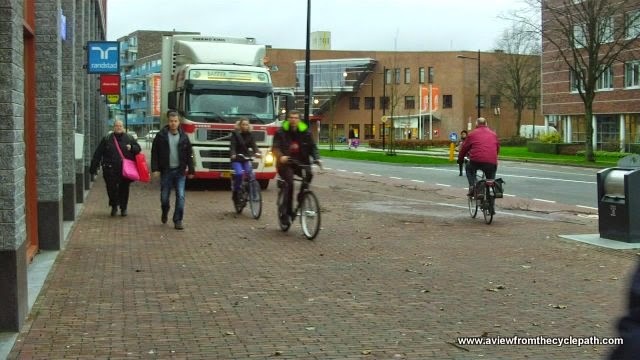 However while these works bring obvious benefits for drivers, the outcome appears to be to make conditions slightly worse for both cyclists and pedestrians in Assen. The three bicycle bridges were completed first, at the end of 2014, and I won't gloss over the problems that they cause. 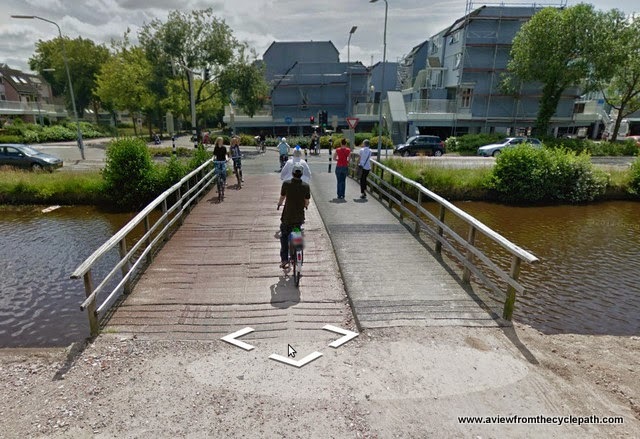 The bridge shown at (1: Vaart / Het Kanaal) on the map above featured on my blog four years ago. It had previously been moved as a part of a large and successful project from another position nearby to this location in order to complete a high quality direct route for cyclists. The bridge combined a 3.5 metre wide cycle-path with a 1.8 metre wide pedestrian path, allowing both cyclists and pedestrians to access the city centre without conflict. While this bridge was 5.3 m wide in total, that still made this the narrowest part of a very high quality route from a new suburb to the city centre. At the time when the route was re-constructed, it was considered to be important that cycle journey times should so short as possible in order to make cycling into the most attractive mode of transport from the new suburb to the city. Unfortunately, some of that good work from seven years ago has been un-done. The replacement bridge is much narrower at just four metres wide in total. There is no separate surface for pedestrians. Conflict occurs between pedestrians and cyclists required to "share" because pedestrians are much slower than cyclists and they meander while cyclists travel somewhat faster and need to maintain their momentum. Conflict is particularly a problem where paths are busy (the three locations highlighted in this blog post can be very busy) and at narrow points such as bridges . Everywhere in the world where shared use paths have been built this same problem occurs. That shared use paths didn't work well was understood in the Netherlands at least a decade ago and planners in this country were once careful to avoid creating these problems. Lessons from the past appear to have been forgotten. The new bridge is to be "shared" by cyclists and pedestrians together, meaning that people who attempt to use the cycling route as it was intended to be used - i.e. as an efficient route to the city centre - will now be delayed whenever pedestrians are crossing the bridge and those pedestrians will experience the same discomfort due to cyclists being "too fast" as is experienced in other countries. The second bicycle bridge is number three on the plans above. The Venebrug, This is the only one of the three which is a small improvement over the old. The original bridge at this location was already much too narrow, just 3.5 m wide. 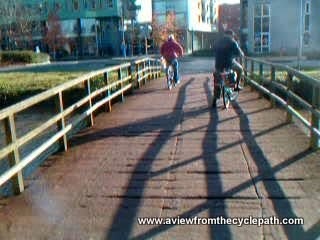 It never had a separate path for pedestrians and this bridge was therefore one of very few places near the centre of Assen which demonstrated the problems caused by shared use. Luckily the problems were only on the bridge itself and the bridge is quite short. At either side of the bridge there was separate infrastructure for walking so the problem was at least on a very small scale. inadequate bridge which came before. The replacement bridge in this second location is fractionally wider at 3.8 m, so can be seen as a slight improvement over the old, but this is so only because the original was so inadequate. A mere 30 cm improvement in width when the older bridge was so obviously inadequate and should always have provided separately for pedestrians isn't something to get excited about. A chance to upgrade the experience for both cyclists and pedestrians has been missed. Update 2016: A new central reservation for people crossing the road is absurdly narrow. At just 1.8 m in width it is narrower than most bicycles are long. The situation here is not improved over that shown in the video above, but has become worse due to the wide driving lanes encouraging higher speeds and the change in parking regulations encouraging more people to drive to the adjacent car park than did so two years ago. The new cycle-path in this location has a drainage problem and is almost flooded right at the point where a cyclist needs to put their foot down to give way to a car-park entrance. This is supposedly part of a primary cycle route but it is not nearly high enough in quality. There is a very obvious difference in width between the old bridge and the new bridge in this location. The separate pedestrian crossing which was designed for the older bridge now lines up with nothing at all. This video demonstrates how minor conflicts arise even at quiet times. The third cycling bridge is shown as bridge 4 on the plans above. The Molenbrug is on a main cycling route which has always been far busier than the Venebrug. That is probably why this bridge always was considerably wider. This bridge had a separate path for pedestrians. I never measured this bridge. Estimating from Google Earth it appears that it was around 5.5 m wide. people at a time crossing. The replacement for this bridge is the biggest disappointment of the three. At just 3.8 metres wide, this is the biggest percentage reduction in width. Even on a relatively quiet winter afternoon, as shown in the video above, you can see the problems caused by the new bridge. It is very obvious that pedestrians need a separate path. Again, how did Assen make such a mistake as to build this inadequate infrastructure to replace an existing and successful bridge ? A local campaigner asked a councillor why the bridge had been built more narrow. The reason given was one of "bezuinigingen" - budget cuts. In this project which is being funded with a total of €1.5 billion and which will lead to much more convenience for drivers elsewhere in the city, we are being asked to believe that a slightly too narrow bridge for cyclists is the item on which savings must be made. A view of the new bridge with the original crossing shows how the pedestrian crossing built to line up with the old bridge now leads into the water because the new bridge isn't nearly so wide as the old. Note the pedestrian in front of a cyclist approaching a bollard, which creates a dangerous pinch point for the cyclist and leads to close passing which makes the pedestrian feel uneasy. This photo was taken just a day after the new bridge opened. The conflict was visible immediately. It's just as you'd expect in any place where cyclists and pedestrians are supposed to "share". 2016 Update: the new junction is nearly finished. There is no longer a traffic light here to control motor vehicles and the width of the cycle-path at this side of the canal has been reduced to a dangerous 2.8 m - well below the allowed minimum of 3 m for a bidirectional cycle-path. Cyclists bunch up here on the road waiting for space to pull onto the cyclepath. They do this in front of motor traffic. In the past, this crossing had a perfect safety record. It has now been transformed into a bad example of an uncontrolled crossing - the type of crossing which is most dangerous in Assen. Watch a new video about the problems caused by this junction. When crossing the road at this point, cyclists must now stop in the middle of two streams of traffic which no longer has to give way to cyclists. The central reservation is too narrow for this to be safe for anyone with a longer than average bicycle (e.g. a tandem) or anyone who is pulling a trailer, for instance, a child trailer. their new path because there are steps. The Venebrug is linked by a path to the Venestraat. In 2008, this link consisted of a 3 m wide cycle path and a separate parallel 2 m wide pedestrian path. The old cycle-path was of smooth asphalt and no conflict occurred here because of the separate paths. The replacement path does not have a parallel pedestrian path so there is now conflict between cyclists and pedestrians. The new path has the same inadequate three metre width as the old cycle-only path, but it is surfaced with bricks which give a less smooth ride to cyclists than the old asphalt. Note that this video was made part way through the reconstruction of Het Kanaal. However, most of the objections raised here apply to the end result. The new cycle-path is not as convenient as the old as there will be far too many places where cyclists must give-way to motor vehicles. Also the new cycle-path is too narrow. It is planned that a separate path for pedestrians will be built, but rather than taking the same line as the old pedestrian path, this will take a less convenient route alongside the water. There are several reasons why pedestrians won't want to use this new path: It's a board-walk so will be rough to walk on, it doubles as mooring space for boats, and it also requires use of steps, so will not be accessible to all pedestrians. Pedestrians will continue to use the cycle-path because they are not being provided with a usable alternative. Update 2016: As predicted, the design of the cycle and pedestrian paths alongside Het Kanaal have led to regular conflict. Pedestrians almost never use the pedestrian path by the water with the steps because it is in an unwelcoming place and of some people can't use steps. For cyclists it's inconvenient because the path is not really wide enough even just for cycling in both directions and when pedestrians are walking in both directions at once it's often necessary to come to a complete halt. This infrastructure doesn't well for either cyclists or pedestrians. The three other bridges are for driving cars over as well as for cycling. In each case there is no bridge in the current situation as the canal was filled in some years ago. Details of the car bridges are not public. The only information easily available is in the form of pictures from the architects which feature no cyclists at all. The bridge at location (6) is to look like this. It appears to be neutral so far as its effect on cyclists is concerned but we don't have much to go on. There is already a signalized crossing in this location for bikes. The cycle-path shown along the side of the canal doesn't exist at present so this could be one small gain. Note that bridge 5 is to be better than it originally looked. See the update below. The bridge which I'm most concerned about is that on Groningerstraat, shown at (5) above. This is currently a very efficient Simultaneous Green traffic light junction. I use it often to head home from the centre of the city, turning left diagonally across the junction in order to make a quick journey. From what we've been able to make out, this junction will no longer have simultaneous green traffic lights. A representative of the company behind these works talked about getting rid of the diagonal crossing. The impression I was given at the meeting is that cyclists will in future be required to stop twice in order to make a left turn: If so, then this is another step backwards from good design. Note that bridge 2 will actually work better than described in the following paragraphs. See the update below. The last bridge for cars is that on Nobellaan, shown at (2) above. This is part of our most direct route from home into the city centre so we use it often. Behind the viewpoint of the camera in this photo there are rather good cycle-paths. It is from this point onwards that the quality of our current route to the city centre drops. It was my assumption when I wrote about this location at the start of 2012 that the old low quality infrastructure would be improved upon by lengthening the cycle-paths which lead to this location until they eventually took cyclists safely to the city centre. That has not happened and it appears that nothing will improve with the new bridge. What's on offer here is low quality provision for cyclists: on-road cycle-lanes with all their attendant problems. A few hundred metres onwards from this location we reach the bad example cycling infrastructure design in a new development which I covered in my last blog post. representing the new bridge at (2). help with crossing the road. You'll note from the map at the blog post that there is supposed to be a walking and cycling route between (1) and (3) which crosses the road at this point. Unfortunately, there is no good way of crossing the road at this point now and this will actually get slightly worse in the future if the available pictures which represent the route are accurate. The existing partial central reservation in this location offers a modicum of safety for cyclists and pedestrians when crossing because it separates the two opposing flows of motor traffic, but this does not exist with the new situation. Crossing the road safely here will become more difficult because there will be two lanes of cycle traffic and three lanes of motorized traffic to cross in one go without anywhere to stop in the centre. 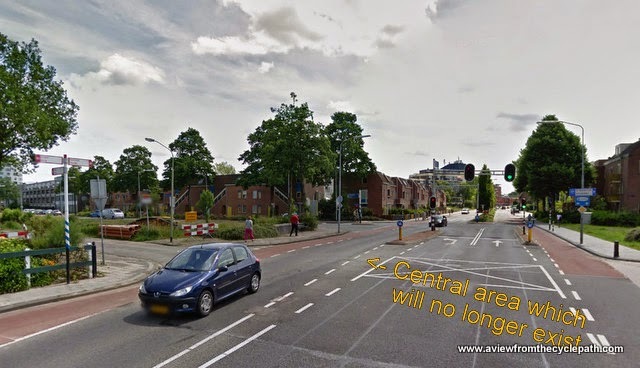 A few years ago, Assen was demonstrating very well how building central reservations could make crossing easier in far less busy locations than this, but the ambition to make crossing easier and safer appears to have been forgotten about. Building of the new bridge at location 2 on the map at the top of this page is starting in two days. The short meeting to which people are invited to see the plans doesn't take place until an afternoon 13 days from now. Therefore there is no chance for anyone to say "no" because building will start before those who might object to the plans have seen what is on offer. So much for democracy. This bridge will break the existing primary cycle route along the North side of Het Kanaal. However, a new and improved link will be created on the South side of Het Kanaal. The existing space in the middle of the road is long enough that one can wait with a bicycle in the middle and therefore it is not necessary to cross all three lanes of motorized traffic at once. Children use this on their way to and from school. How will it be possible for them to cross safely when the new bridge is built ? Have the designers of the Florijnas project forgotten about Stop De Kindermoord ? Ahead of the bridge are these on-road cycle-lanes, Newly built in 2012, they force cyclists to ride next to buses and trucks (which do not keep to the 30 km/h speed limit). There is no reason for this low quality infrastructure. There is no lack of space here. The pavements have been built extremely wide and space has been found for plants in the middle of the street. Almost all cyclists make a left turn across the road next to the tall building. It's been known to be dangerous since at least 2005 but this street redesign did nothing to improve the situation. 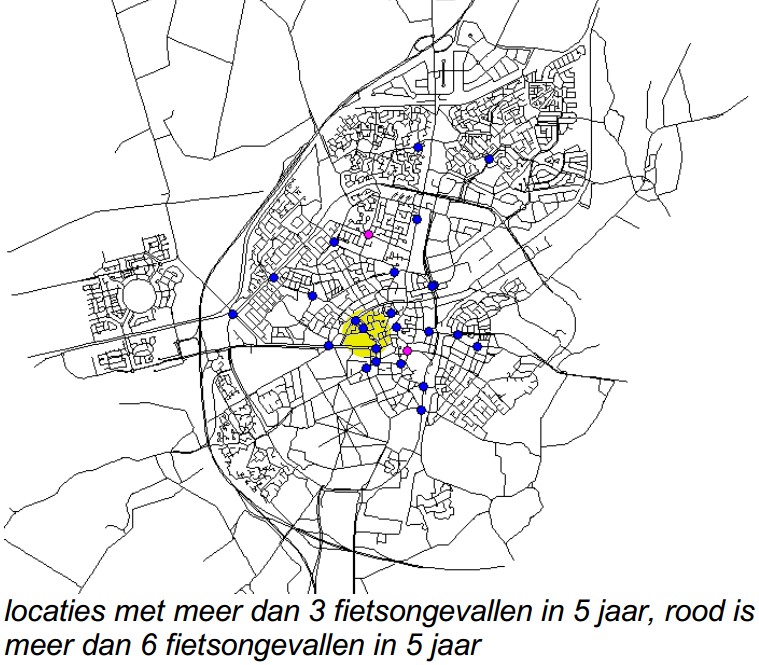 By 2005, well over 30% of all trips within Assen were by bicycle yet the ambitious "Fietsverkeer nota" document from that year was modest and talked only about how Assen had "the potential to become a real cycling city". At that time, just €4.5 Million could be allocated for the work on cycling infrastructure but this was spent wisely, an enormous number of improvements were made and the cycling modal share increased as a result. cycle-paths were surfaced with tiles. now see asphalt replaced by bricks. The 2005 document discussed such things as how important it was to improve links to areas for shopping, employment, schools, entertainment and the railway station. It was recognized that cyclists needed smooth asphalt or concrete surfaces in place of tiles or bricks, that a fine grid of high quality facilities were required to make cycling attractive to all destinations, that cycle-paths needed to be wide in order to reduce conflict, that cycle-routes should be direct, that cyclists should have the shortest possible waiting times at traffic lights, or none at all, and that the Simultaneous Green traffic light design with two greens for cyclists in each cycle of the traffic lights was desirable. There were many other recommendations in this excellent document. We moved to Assen in 2007 because we were impressed both with the existing infrastructure and also the ambition for more cycling. In 2011 I wrote about how things would continue to get better. An official document said that "By 2015, so many journeys as possible must be by bike. Bikes must more frequently take priority over cars". Sadly, I don't see much of that ambition in the new plans. 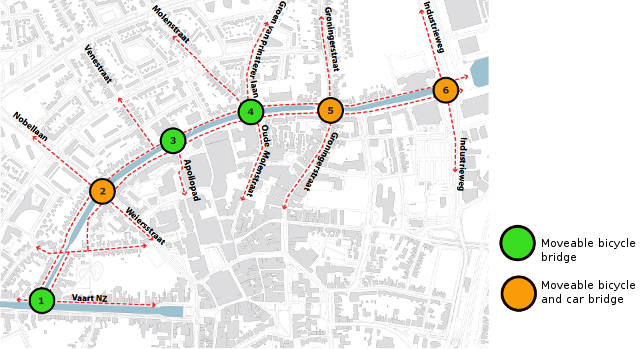 Assen now has an enormous amount of money to spend on infrastructure, but the new proposals include few improvements for cyclists and several off them are actively hostile to cycling. Funding is being found for expensive projects which look great in architectural drawings but which are not thought through from the point of view of a cyclist. Much is being spent to create huge areas of concrete which no-one will use, simply to satisfy an architectural trend. By blindly following this trend, the city risks undoing much of the good that was achieved in the past. What you read about above is not something unique to these bridges (there are other plans which I may well write about later) or even just to Assen. Across the Netherlands there is now far too much emphasis being placed on appearance of projects and not enough on their functionality. No country and no city is immune from declines in cycling. No place gets a free pass, no place has cycling so embedded in its culture that people won't stop cycling if it becomes unpleasant or dangerous. Cycling already declined declined across the Netherlands when policy favoured motoring in the mid 20th century. When Assen was an unpleasant city for cycling, cycling declined in Assen too. Cycling is a very fragile mode of transport. It will only remain at a high level or grow if facilities for cycling are kept to a very high standard. The area outside the new cultural centre. Most of my readers are from outside the Netherlands, and having read many positive stories from Assen in the past I suspect some will be surprised at my sentiment in this blog post. No place is perfect. I try not to present an unrealistic picture of the Netherlands and that is why I have written about problems in Assen and elsewhere in the Netherlands many times before. I don't write blog posts about the newest infrastructure or regurgitate press releases which claim improvements in safety which are not confirmed by actual data. It's why I caution about assuming that everything Dutch is worth emulating. It is only worth copying from the best examples in the Netherlands. Increasingly, the best examples are not necessarily the newest, and they are usually not the most well publicized either. Some of these bad examples have been part of our study tours for the last few years. We will be running study tours again this year and again they will offer an honest and independent appraisal of what works and what does not work in the Netherlands, with no commercial reason to push one solution over another. There was a public meeting today in which parts of the plans could be seen which were not available before. People who lived along the route were invited to see plans at an earlier stage, but not those who live elsewhere in the city and use these routes. Better communication could have helped avoid concerns about the quality of the work being carried out. It has always been difficult and dangerous for cyclists heading south to make a left turn to continue east north of the canal, on what is currently a primary cycle route. Crossing the road in this location was assisted slightly by a gap between traffic lanes which will be taken away by the new design and this caused concern. This junction turned out to work extremely well. Watch a video showing this junction in 2016. At this bridge there is currently a simultaneous green traffic light junction. Motor vehicles can use the road North of the canal in both directions and south of the canal in order to head North. With the new situation, motor vehicle access is restricted to southwards only for vehicles north of the canal and there is no exit for motor vehicles from the city centre south of the canal at this location. In the past it was possible to make a left turn onto the far side of the canal in order to head west. We now have the option of making a left turn immediately onto the cycle-path on the south side of the canal, without having to wait for traffic lights. Assen has much very good cycling infrastructure. 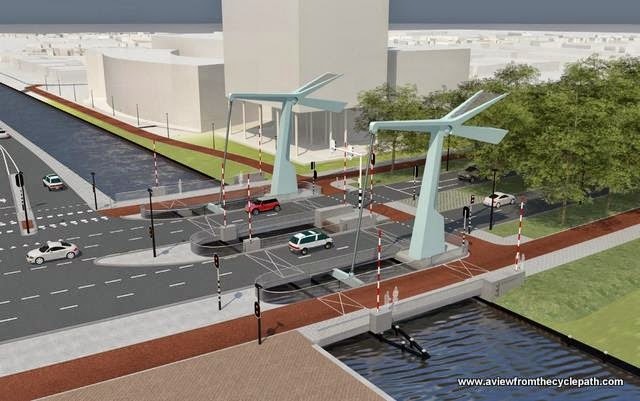 Read more about the best examples of infrastructure in Assen. 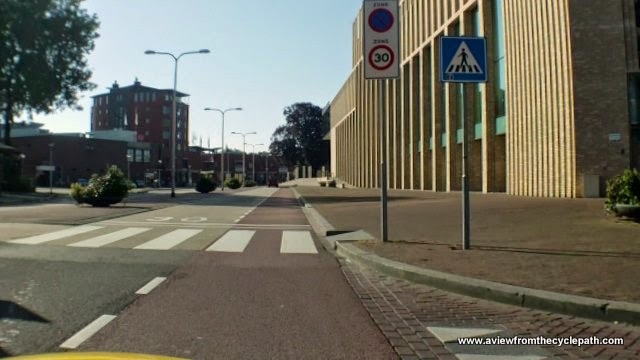 How poor design creates conflict: An inconvenient and dangerous junction in Assen. 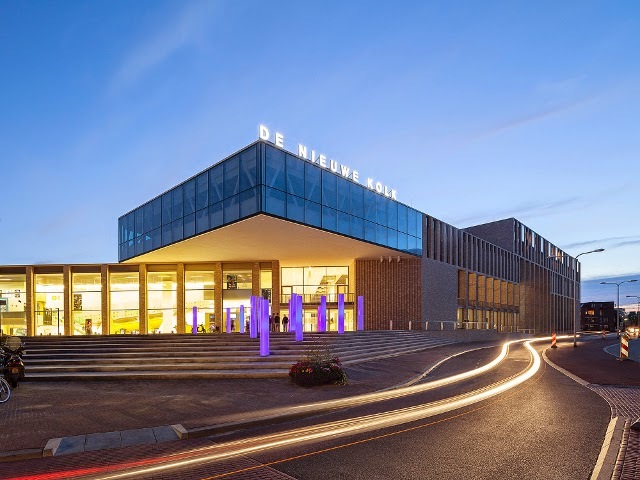 Just over two years ago, a huge new cultural centre, De Nieuwe Kolk, opened in Assen to accommodate the library, cinema, theatre and other arts related facilities. It's a very impressive looking building and it provides some great facilities for local people. All the problems shown in the video and the photos below occur within a 100 metre long stretch of new road. Not only the road but the large building next to it is also completely new. It is situated on top of an entirely new under-ground car-park which goes down several floors and required disturbing everything which already existed (plumbing, drainage, electricity etc.). There was a very good opportunity to improve conditions for cycling here as part of this work. To have done so would have cost a tiny fraction of the cost of the development as a whole. Sadly, that opportunity was not taken. The enormous space between buildings on either side of the road (at its widest about 60 metres) has been used in order to create a specific look and to cater for the needs of motorists. It has not been used for the maximum benefit of pedestrians and cyclists. The pavements (sidewalks) for pedestrians are incredibly generous even though the number of people who walk on them is low. Decorative steps to reach the main entrance of the new building take up a huge amount of space and a central reservation which accommodates a small number of plants is also several metres in width. Buses have functional bus-stops, taxis have a taxi-rank and there's a large loading area opposite the building. Motor vehicles were very clearly the main priority of the designers. This road works well enough by car, providing a direct through route which is part of the busy inner ring-road. There are two pedestrian crossings to look out for, but apart from that, motorists rarely have to slow or stop. That leaves one mode of transport which has to be fitted in around the others: Cycling is important in Assen. 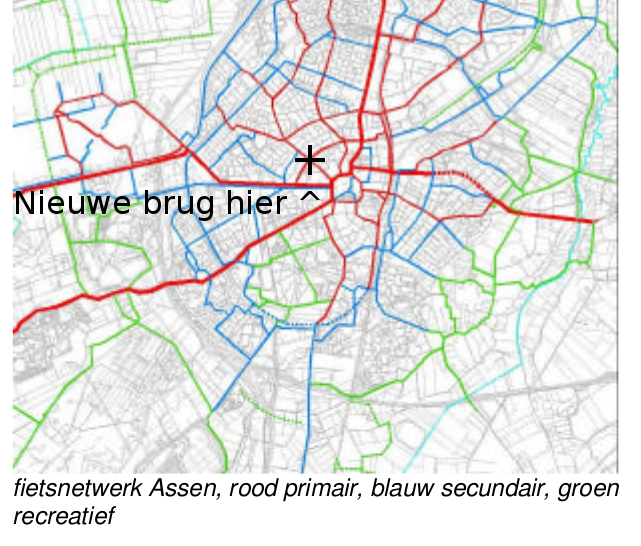 Assen residents make an average of nearly 1.2 journeys per day by bike and more shopping takes place in the city centre by bicycle than by other means. City centre businesses rely upon people being able to ride bikes to the city in order to survive. Sadly, making cycling safer and more convenient was not at the top of the agenda for this design. On this route to the city centre, cyclists have been provided with nothing more than on-road cycle-lanes. No attempt at all was made to improve on the inadequate previous layout. It has been known for many years that merely lowering speed limits limited effectiveness for improving cyclist safety but that's the only positive step which was taken. While a 30 km/h speed limit applies to this section of road, many people drive their cars faster because the road clearly can be driven along at a higher speed. 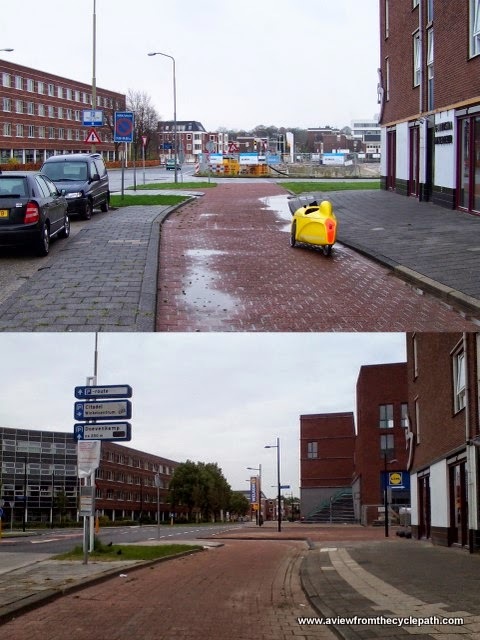 The result is that within this short length of road, cyclists experience the wide range of problems as shown in the video above and the photos below. Note that the architect's photo, taken soon after construction of the building. This emphasizes the appearance of the area, de-emphasizes conflict due to its design, doesn't give any hints as to how cyclists should behave here. Note that it shows no outdoor cycle-parking. This was retro-fitted at a later date after people realised how inconvenient it was to access the new building by bicycle. Note the line taken by the car headlights. Even in the best photo that the architects could take, cars consistently enter the cycle-lane when going around the corner. These points are expanded on below. There are many perpetual problems with on-road cycle-lanes, one of which is that drivers have a natural tendency to encroach on these lanes as they go around corners. This happens regularly on both sides of the road in this location. You can see it even in the architects' photo above. The white tracks left by the headlights of a passing car show that this car also entered the cycle-lane when going around the corner. Good cycling infrastructure should keep cyclists away from motor vehicles. Drivers everywhere have a tendency to enter cycle-lanes where they go around corners. The Netherlands is no different. This is one of the reasons why use of on-road cycle-lanes erodes the safety of cyclists. Because there is a designed in space for drivers to make U-turns, they do this regularly. However, the lanes for motor vehicles are not wide enough to avoid problems so nearly every car or van which makes a U-turn enters the cycle-lane in order to do so. A still from the video above. Cars which are about to U-turn pull into the cycle-lane in just the same way as cars which are parking. In the video I was overtaken by this car which then pulled to the right and slowed down. I pulled out slightly to pass but the car then turned left across my path. Note that bollards are used in an attempt to prevent cyclists or drivers from encroaching on the wide and usually empty pavement at this point, but nothing protects cyclists within the cycle-lane. Not only do drivers make U-turns, but they also turn across the cycle-lane to enter a taxi tank and loading area. Take note not only of where the car is turning into but also the following danger just a few metres further along - a bus-stop which requires buses to cross the cycle-lane. Assen has many good examples of how cycling infrastructure can be designed to avoid conflict with buses at bus-stops, but none of them served as examples for this busy street. Instead, cyclists on this short stretch of road experience all the same problems as cyclists anywhere else in the world where proper bus-stop bypasses are a rarity. Cyclists are endangered by buses overtaken by buses which then pull into the cycle-lane across their path and buses have a tendency to pull out of bus-stops while cyclists are riding past. In the past, the east-bound bus-stop was before the corner where at least there were reasonably good sight lines. It has now been moved to after the corner. A view in the opposite direction from the photo above. A bus-stop immediately around a bend. Assen has many bus-stop bypasses which remove conflict between buses and cyclists. Almost all of them are located on roads which are less busy than this one. Neither bus-stop built as part of this new development includes a proper bus-stop bypass to keep cyclists safe so there are clashes between cyclists and buses pulling in and out of the bus-stops. Many cyclists from the west of the city turn left at this point to enter the city centre. Turning left from a cycle-lane in a country where the convention is to drive on the right requires taking a good look over one's shoulder while also judging what is happening in front. This is increasingly difficult with age. Many older people cannot look around so easily as they could when they were young. Making a left turn also often requires a cyclist to accelerate to pull out in front of a car. This is another factor which discriminates against those who are less able and it requires a level of confidence that the driver behind is paying attention. The left turn takes place on a bend where motorists often cut the corner. It happens at the same point as where pedestrians may cross the road and where motorists may (or may not) slow down or stop due to those pedestrians. It's almost exactly at the point where motorists can make U-turns, which leads to unpredictable behaviour as drivers swerve right into the cycle-lane before they making a sharp left turn. Drivers never turn left at this point so any motor vehicle which manages to pull alongside and begin to overtake very effectively blocks cyclists from being able to make their turn. This is a very busy cycle-route. Most cyclists need to make a left turn here to enter the city centre. This is difficult because they are encouraged to ride on the right side of motor vehicles and because the pedestrian crossing is located exactly where cyclists also need to cross. Note that again someone has chosen to use the pavement rather than cycle-lane (disability buggies have the status of bicycles in the Netherlands). Any bus in this position is likely to swerve right immediately after the pedestrian crossing in order to enter the bus-stop. The most convenient cycle-parking for the new building was retro-fitted outdoors in this location after local people objected to having to use a less convenient indoor cycle-park. This was intended by the architect as a huge empty space beside the building. Note also the pavement cyclist. Many people prefer to cycle on the pavement here rather than the road. These cycle-lanes measure 1.9 m wide, meeting recommended widths for cycle-lanes, but at busy times there are often too many cyclists here and people who wish to overtake must use the main traffic lanes. This of course brings another potential conflict - between cyclists and motorists. At busy times these cycle-lanes are not really wide enough. Not only cyclists but also pedestrians are inconvenienced by the new road layout. There are crossings only at either end of the building while many people have a reason to cross at points in-between. No matter what planners might hope, pedestrians simply won't walk long detours to cross the road. This photo also gives another view of the popular conveniently placed outdoor cycle-parking which the planners thought cyclists didn't need. A lot of people cross the road while pushing their bikes because there is no other way to make a left turn into the cycle-lane on the other side of the road and ride away from the camera on the correct side of the road. Neither pedestrians nor cyclists can cross the road except at either end of the long building. The distance is simply too great. Many people prefer to cycle on the pavement here rather than the road. The sight of cyclists on the pavement should be seen as a flag which indicates that road and cycle infrastructure design is not adequate. Children do it. Cyclists should not be forced to break the law in order to achieve safety. Women also cycle on the pavement here. And the cycle-lane is unattractive enough that a significant number of men cycle on the pavement here too. Cycle-lane parking is a problem everywhere that cycle-lanes exist. When drivers park in the cycle-lane this makes the already difficult situation around this junction even worse. 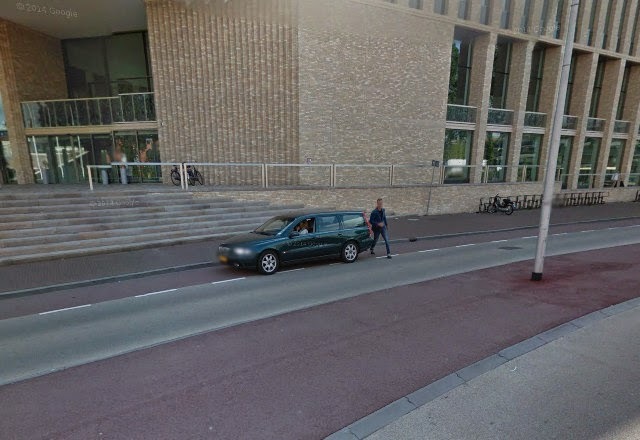 Google Maps immortalized another of the cycle-lane parkers. You may wonder why I have waited until 2015 to publish a blog post about problems caused by infrastructure which was completed in 2012. This area has already featured as examples of "what not to do" on our study tours but it took time to get around to writing about these problems. I held off at first with public criticism because the situation here had not really been made significantly worse than it was before. It's not realistic to expect that all steps taken will progress cycling. There will always be occasional mis-steps. Almost everything that changed between 2007 when we moved to the city and 2012 was good. When I wrote in 2013 about what had been achieved in the last six years, I briefly mentioned the problems with the indoor cycle-parking at this location but was otherwise positive about almost everything except a new shopping centre and the road outside, which I was surprised to find were designed as if cyclists didn't matter at all. This has turned out to be part of a destructive trend. Current plans for Assen are simply not so good as those from ten years ago. More again on this soon. in yellow). An opportunity missed. We moved here in 2007. We decided upon Assen after exploring much of the Netherlands and finding that this city combined the sort of life-style that we wanted with some of the best cycling infrastructure that we'd seen anywhere. What's more, Assen was not only already good but also had a huge ambition, expressed in an official document, to improve itself further for cycling. Unfortunately, this no longer seems to be the case. Assen's ambitions are no longer what they were. No country and no city is immune from declines in cycling. No place gets a free pass, no place has cycling so embedded in its culture that people won't stop cycling if it becomes unpleasant or dangerous. Cycling declined right across the Netherlands when policy favoured motoring and when Assen was an unpleasant city for cycling it declined in Assen too. Cycling is a very fragile mode of transport. now a blog post about this location. Cycling can only be maintained and grown by investing in ever better conditions for cyclists. That is precisely what the Netherlands did from the 1970s until very recently and this successfully reversed the decline up until the 1970s. Stopping investment now, on the grounds that the cycling infrastructure is "finished" (an expression used by a councillor in a recent meeting at which I spoke about problems with another new design for Assen) will lead not to a constant level of cycling despite changes elsewhere to favour driving, but to a decline in cycling. This is doubly true when current plans in many cases will degrade conditions for cycling. There will be more on the problems with the new plans in subsequent blog posts. The Netherlands has not turned against cycling, but across the Netherlands it seems that many of the principles on which the high cycling modal share of this country was built are now being pulled apart by people making change for the sake of change. Cycling is taken for granted by planners and architects. New plans fit cyclists around the edges of currently fashionable things deemed to be more important, such as the extra wide pavements shown above or nice lights. The Netherlands still leads the world on cycling, but that doesn't mean that everything in this country is good for cyclists, nor that every Dutch designer or architect has any real understanding about how to design good infrastructure which encourages cycling. It is important to be skeptical about claims any made by any architect or urban designer from any country. With the rise of interest in Dutch cycling infrastructure it's especially important that you don't approve of anything just because it's described as Dutch, but instead seek to build infrastructure which emulates the best of what they Dutch have achieved. We are interested in what works, not what is currently most fashionable. In our independent study tours we show you not only the very best and most effective cycling infrastructure but also the mistakes which the Dutch are currently making and which you can learn not to make. 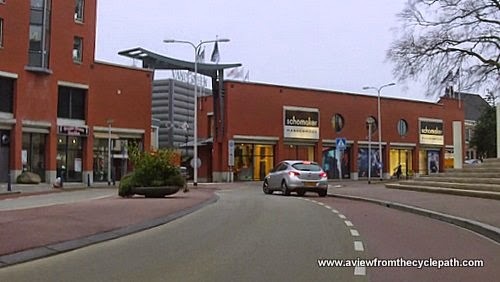 Other examples of where Assen has made recent planning mistakes include the unpopular and dangerous Shared Space at Kerkplein and a new shopping centre built with no provision for bicycles.